Narasimha, or Nrsimha or Narsingh, is the fourth incarnation of Lord Vishnu and is popularly known as ‘man-lion’ or ‘half man – half lion’ incarnation. Narasimha Jayanti 2019 date is May 17. The main aim of the Narasimha avatar was to end the tyranny of Hiranyakashipu and restore the path of Dharma. Prahlada the young son of Hiranyakashipu and an ardent devotee of Lord Vishnu paved the way for the removal of Adharma. Narasimha Jayanti is observed on the 14th day of the Shukla Paksha (waxing phase of moon) in Vaisakha month (April – May). It is believed that Lord Vishnu appeared in the form of Narasimha on the day to destroy demon Hiranyakashipu. Some Vishnu devotees observe a fast on the day. Special prayers and pujas are performed on the day. Jaggery and gram sprouts are offered to the deity. How to Observe Puja and Fasting on Narasimha Jayanti Day? In morning after taking bath perform Puja to Narasimha with dhoop, lamp, flowers, fruits and naivadya (prasad food). Then chant Vishnu Sahasranama Stotra. After this take a vessel full of water and offer it to Surya and begin the fast. Those devotees fasting on Narasimha Jayanthi day visit Lord Vishnu temples. Fasting is from sunrise to sunset. Those opting for partial fast can consume milk, fruits, and food items not made using rice and grains. People also give alms on the day and perform Annadhanam (donate food to poor). Donating food to poor children is highly meritorious on the day. It is believed that those people who observe Narasimha Jayanti vratam will reach the ‘Vaikunta’ – abode of Vishnu. The most important puja on the day is performed evening when there is twilight - Narasimha appeared during twilight just after sunset. The deity should be offered milk, sugar, curd, ghee and butter during the evening puja. After this the fast is broken by taking Charanamrit. Demon Hiranyakasipu had obtained a boon from Brahma that he could not be killed by man or beast, by day or by night and from inside or outside. And also he could not be killed by any weapon. After receiving such a powerful boon, Hiranyakasipu conquered heaven and earth and declared himself as God and asked people to worship him and not Vishnu. But Hiranyakasipu’s son, Prahlāda, was a staunch Vishnu devotee and disobeyed his father. The whole kingdom worshiped Hiranyakasipu, but in his own house, his son worshiped Vishnu. Father tried all means to change his son, but he failed miserably. 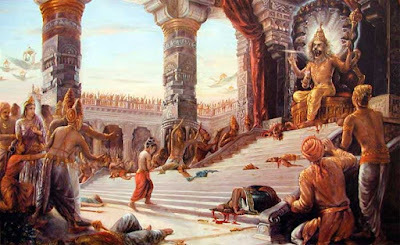 He then tried to kill but each time the young boy escaped from the clutches of death with the blessings of Vishnu. Fed up with his son, one-day Hiranyakasipu challenged Prahlada and, looking to a stone pillar, asked, ‘If your god is omnipresent, is he in this pillar also?’ Prahlad answered, ‘HE is present in the pillar and even in the rust.’ Hearing this Hiranyakasipu slashed hard on the pillar with a sword. Suddenly, Lord Vishnu emerged from the pillar in the form of a Narasimha and slew the demon at dusk. Narasimha killed the demon by keeping him in his lap and tearing his heart with bare hands thus overcoming all the boons the demon had attained from Brahma. If interested take a Quiz on the Narasimha incarnation of Lord Vishnu here.